Saving our Civil War Battlefields benefits our local community by creating jobs and generating tax revenue. An Economic Impact Study commissioned by the Civil War Trust looked at 13 individual battlefields across the country including Franklin to determine who is visiting Civil War battlefields and what impact those visitors have on the local economy. See the study for details. 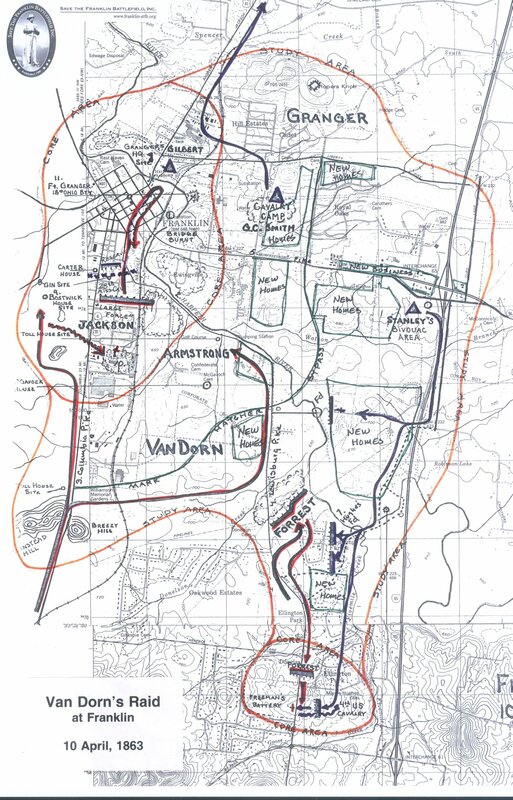 A Poll of Franklin Voters conducted by the Mason-Dixon Polling & Research, Inc. in February 2005 showed that three-quarters of Franklin voters support preservation of the Franklin Battlefield. A July 2001 Poll showed that Williamson County, Tenn. residents overwhelmingly opposed construction of an elementary school on a key portion of Franklin Battlefield. Click July 2001 Williamson County Voter Poll. Over the years, numerous studies of Civil War sites in Franklin and Williamson County have been performed by various organizations. A brief description can be viewed at Battlefield Studies. 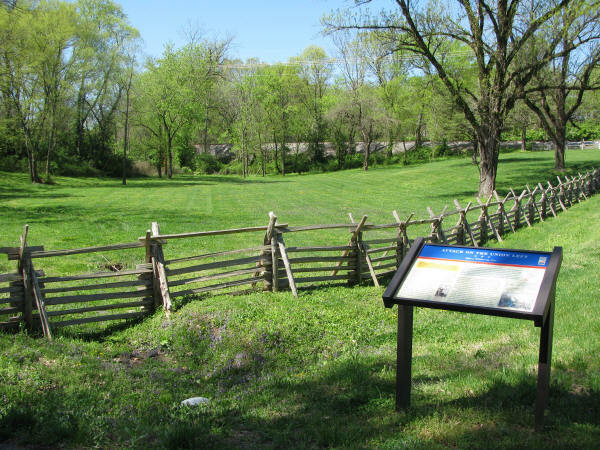 Save the Franklin Battlefield Inc has developed a document which identifies important Civil War sites in Williamson County Tennessee that have the potential to be saved, or in rare cases reclaimed, as Civil War Battlefield Parks. 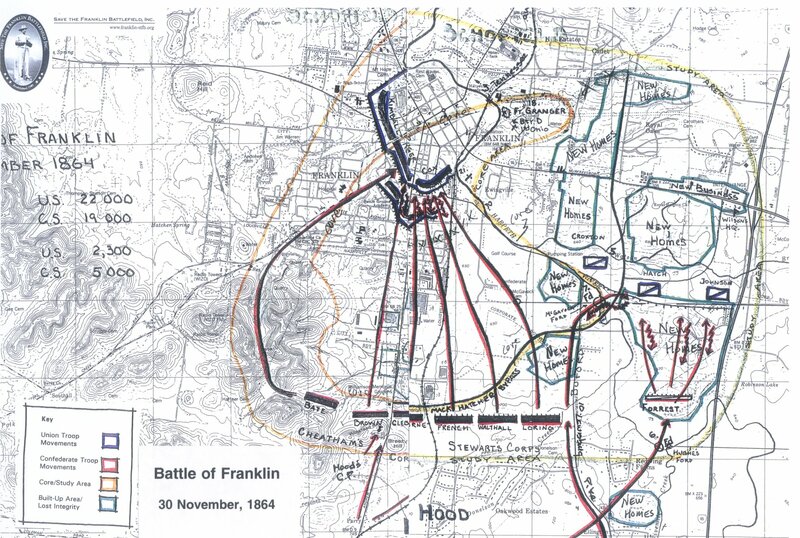 This was a survey of the First Battle of Franklin (April 10, 1863) and Second Battle of Franklin (November 30, 1864) and battlefields in Williamson County. 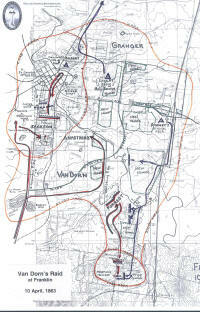 The maps define the area that was studied, and the boundaries of the 'core battlefield' areas. This study encompassed dozens of Civil War Battlefields in several states, and is planned to be updated. Click thumbnail to view map. The Tennessee State Library & Archives is undertaking a project to map comprehensive Civil War history onto the existing Geographic Information Systems data that our local governments use to record their official land boundaries and ownership information. Both public and private utility companies also use the GIS system to record their above and below ground lines, poles, towers etc. Cities map their roads and streets, land use plans and a myriad of other information onto this one official record of land boundary and ownership data base. Each entity adds its information to the system as a unique information layer that can be selectively turned on and off. The counties’ boundary and ownership data is refreshed to the TSLA files on a monthly schedule. There were an estimated 2,600 engagements of some type in Tennessee during the war. A few hundred have been added to the Civil War GIS to date but the work continues. All of this information is available to historians and students online. The site is constantly being expanded but already features many original maps, documents, diaries and photographs from the TSLA historic collections. Hundreds of engagements and battles are pinpointed with aerial and modern map layers. The site provides 1860 county census data and unit histories for every Tennessee regiment from Tennesseans in the Civil War. The system also layers The Official Military Atlas of the Civil War maps onto modern maps, and provides links to narrative information from the Official Records and the Tennessee Civil War Sourcebook. This is a powerful tool for battlefield preservationists.